Hi everyone! 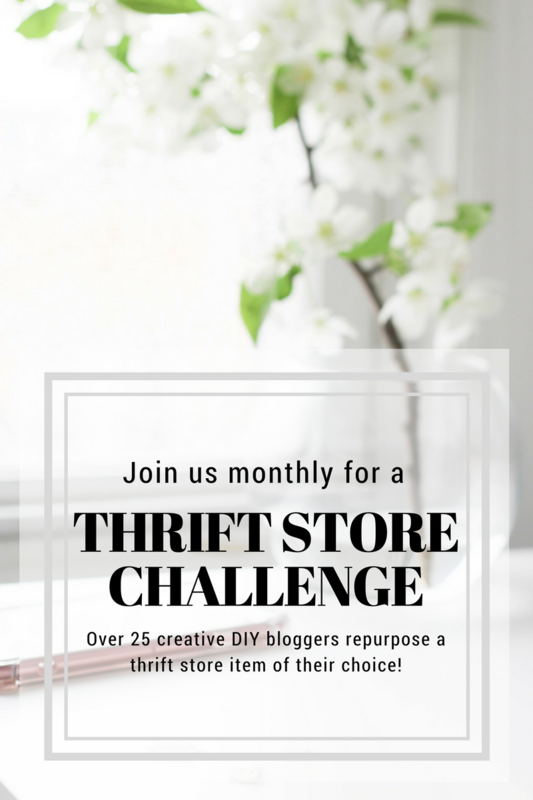 I am back with my favorite challenge, the Thrift Store Challenge! This happens once per month and I get excited about it each and every time. 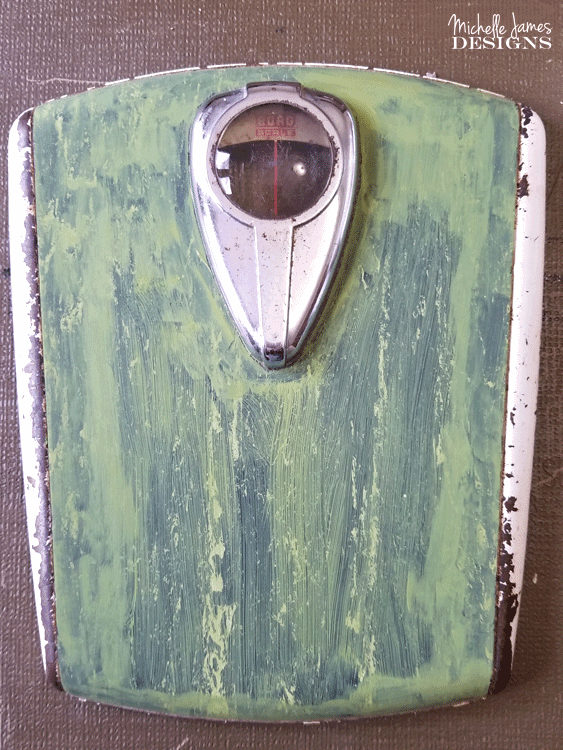 This month I have a vintage bathroom scale update. I can’t wait to show you how easy it was. 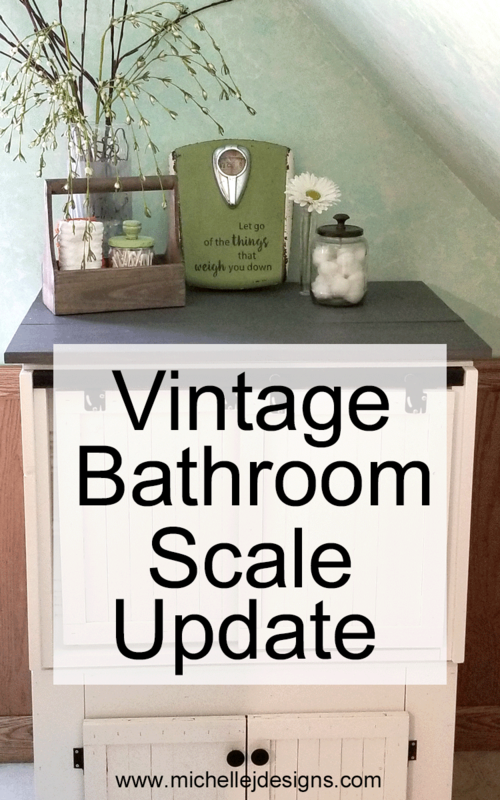 So long ago I pinned the cutest vintage bathroom scale that had been updated into wall hanging with a hook. It is from Denise on a Whim. You can go see her beautiful scale too. I really didn’t think I would ever find the right kind of scale. It had to be old and vintage. Last year my friend Mary and I were at a garage sale and there it was….it was like a light shown down from above and the angels started singing! I picked it up but there was no price tag on it. I asked how much they wanted for it and they told me .50! Ah….yes please! 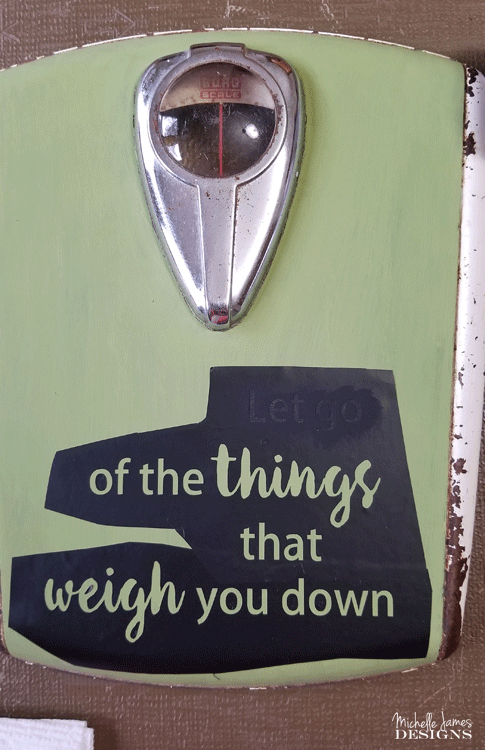 Mary looked at me like I was going to use it to actually weigh myself of something. When we got in the car I showed her the pin. Then she got it. Well, like I said that was last summer. It has been in the garage ever since. Until now! I decided it was time to get it out and fix it up. I have included affiliate links for your convenience! You can read my full disclosure here. Stencil – Or make your own using the Silhouette Machine like I did. The scale is really heavy so I wanted to lighten it up a bit by opening it up and taking out the insides. 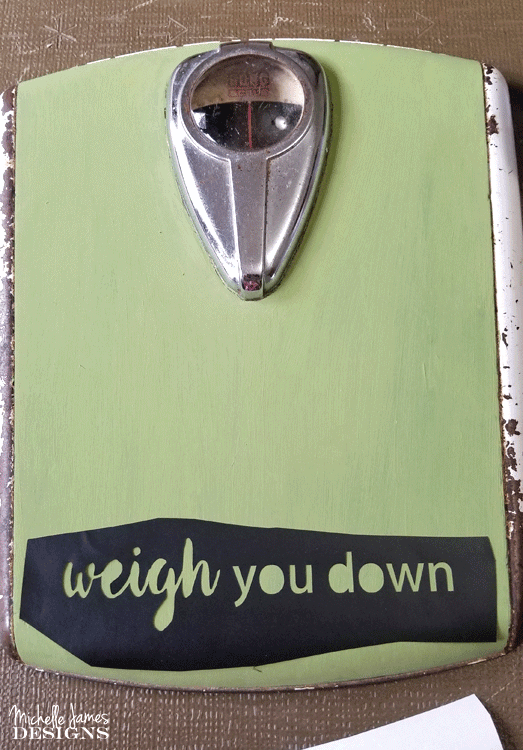 Since it was not going to be used as a scale I didn’t care if it really worked. When I opened it up it was quite full of dust and needed a good cleaning. This was after the cleaning. I was really only able to remove a heavy chunk of metal from the reverse side of the top piece. It made it lighter but not enough to be able to hang it up. (in my opinion) Plus since I had removed that piece I could no longer attach it back on the way it used to be. But I would figure that out later. Right now I had some painting to do. 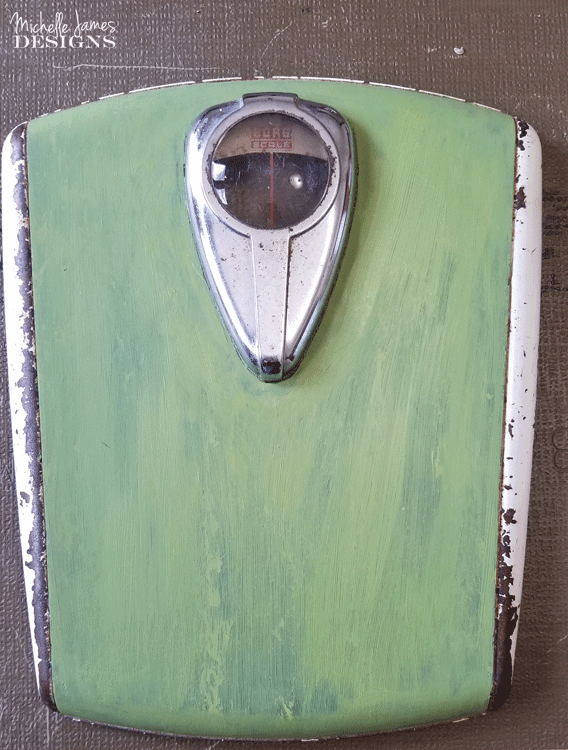 I wanted to cover the black part of the scale because it was just plain ugly. 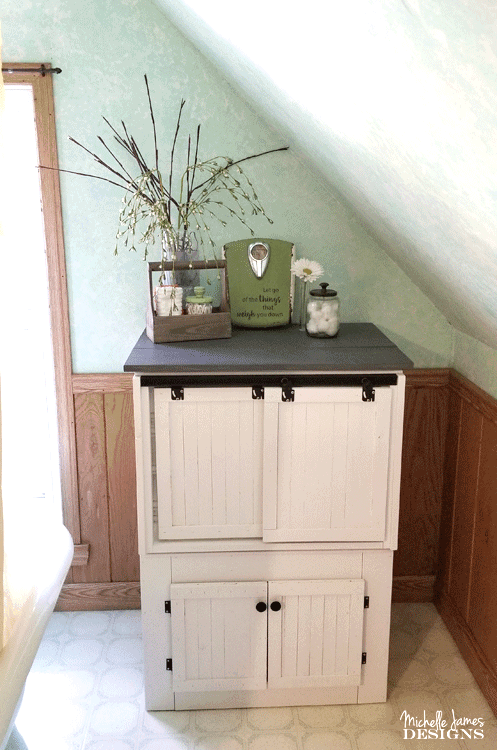 I used some green chalk paint to cover it. 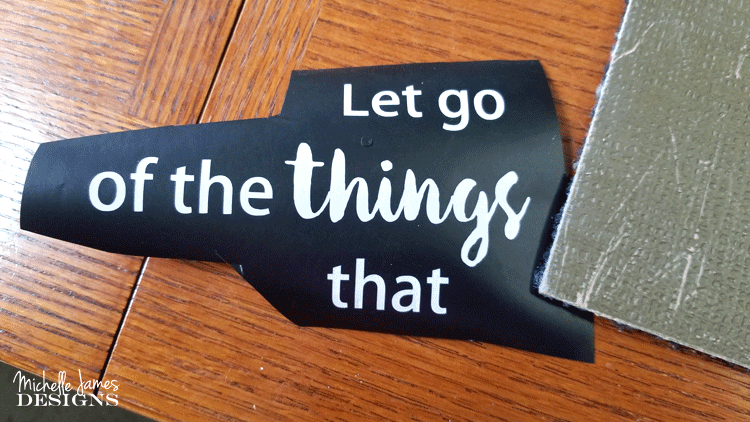 I loved the quote that the original pin had on it but I didn’t want to copy exactly so I changed it up a bit. The first thing I did was create a stencil using my Silhouette machine and some vinyl. 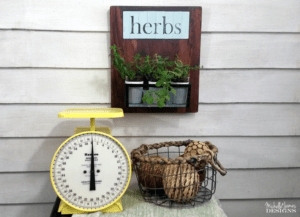 Making your own stencils ensures you have just the right size. I used the black paint and the stencil brush to add the paint. I l. A little bit of sanding distresses it just enough but also smoothed out the paint. In researching the best way to adhere metal to metal, I found that 2 part epoxy works nicely. I have not tried this part yet but I will update the post when I do. Right now it is just being placed together and it seems to work okay for now. 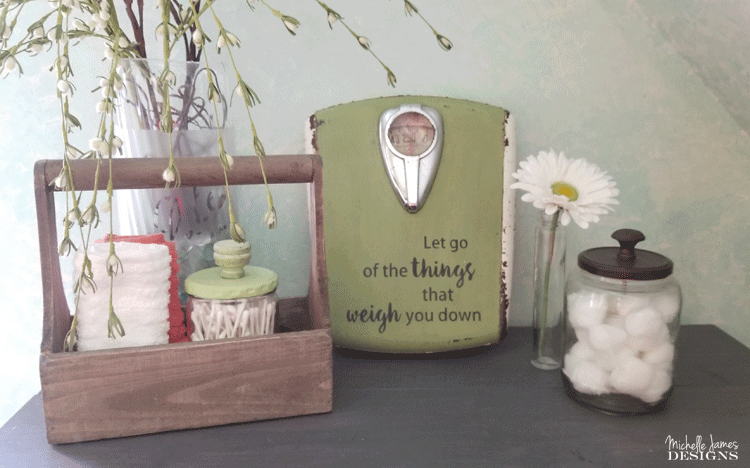 If you would like to see more of my thrifty projects check out my Recycled/Upcycle gallery. What a deal for 50 cents! It looks fantastic in your bathroom and I love the color you used. the message is powerful to. 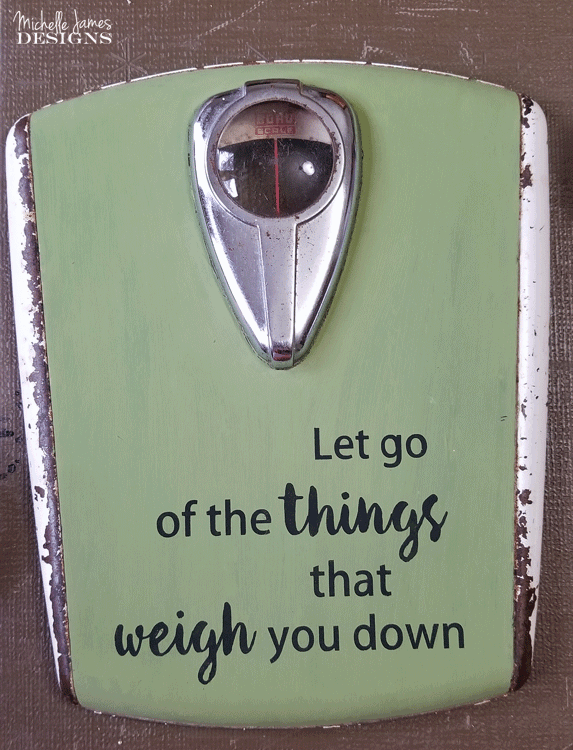 I’m so glad you found it at a garage sale. Hi Jenny! Thank you. I was really happy about it too. And now I love that I finally got it finished. This is such an unusual but awesome find! 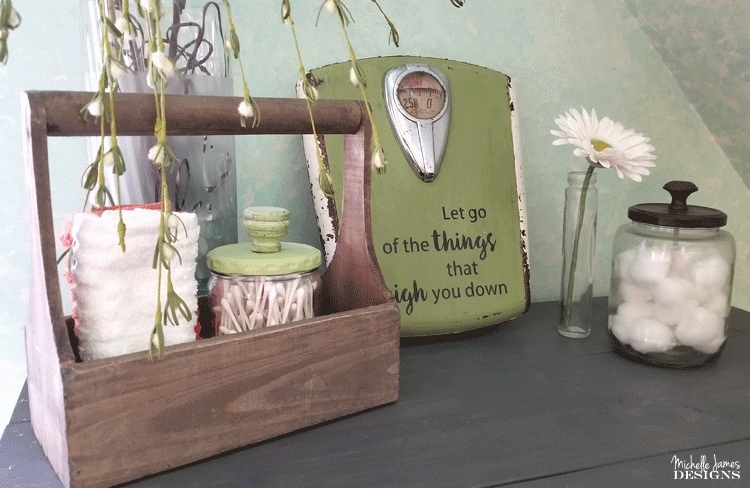 You did a great job upcycling it into a beautiful decor piece. Pinned! 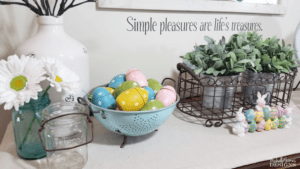 Thank you Chelc and thanks for pinning! It was so worth the wait. oh my goodness… that’s amazing! Now I have to go hunting for old scales!!! Thank you Ann! I hope you find one. They are great. You are on the hunt now. LOL! Thanks so much Deborah. I hope you find one soon! Hi Kathleen! I hope you find one faster than I did. It took me about a year or more but it was worth it. Good luck! Love this! Such a great message and visual statement. visiting from thrift store challenge. Thank you Victoria! It was such a fun project. 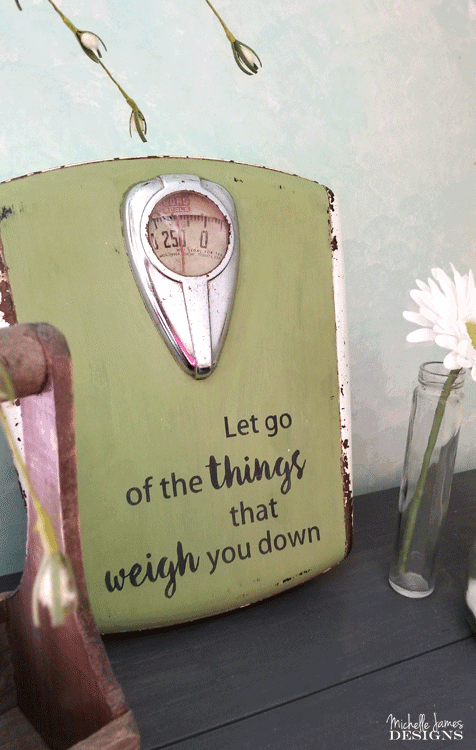 I love the saying and it is perfect on the scale. Hi Debra. Thanks so much. I isn’t the exact quote but I like it this way! Michelle, I love it too! 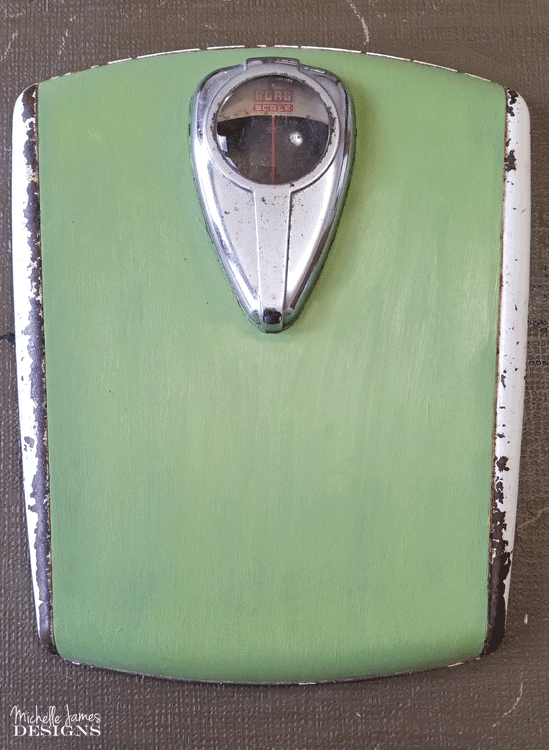 Imagine our hearts singing over finding a vintage scale, but I’ve seen other folks making them over & they’re always cute. Maybe I can find one sometime. I really like the Art Deco vibe it’s got going on, and your stencil and paint colors are perfect. Thank you Florence! I just love it and am so happy I grabbed it when I did. Thanks so much. It was really fun and I am so glad I finally got it done! Since following you and reading your articles and projects, i become ,more creative. for example, i never whould have thought of doing something so incredibly creative as this. That is really sweet Sue. Thank you. It was my hope to inspire people to be creative when I started this little blog. I appreciate this very much. This is adorable!! 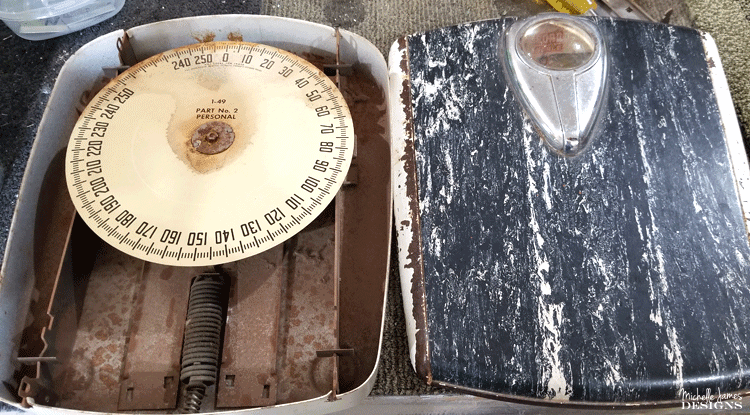 I will definitely be on the lookout for old scales now. Love the quote too .. it’s perfect. Thank you Heather. I loved the one I saw on Pinterest. It was such a fun project.